What is this place, and why does it exist? Until now, in it’s very short life, it has been used to collect news from our coastal communities and posted for people to read and hopefully, generate comments. This was not the original intent. Fisherynation was created for all fishermen of every region, enabling them to interact with one another regionally, and to discuss their regional issues utilizing the democratic process to come to consensus, then being supported by fishermen from around the country for political activism, lobbying our representatives as one united front. The website was also created for interested citizens that desire to learn about the industry. Each fishery management region has its own issues and those that are affected regionally should have a platform allowing them to discuss the issues at their leisure, not only when the regional councils meet. You can discuss them as a group on a schedule of your choosing. The tools are available to form these regional groups, discuss the issues amongst themselves, create polls for voting, hold webinar sessions at predetermined times, then present your conclusions as a group regionally, and nationally. Can you imagine the looks on council member, and ENGO faces when presented with a petition of a thousand strong? Imagine the looks on ENGO faces when a petition with a hundred thousand signatures is presented to Congress. Is this possible? Yes. We can build it, but only you can make it happen. Let’s unify this industry for fishermen, and for future. We cannot forget or exclude the other side of the industry, those that support the industry. We need them to exist as an industry, and we need them to support this effort. Boat builders, machine shops, lawyers, lumpers, cutters, welders, truckers, fuelers, equipment manufacturers, engine and gear dealers. Net builders, vessel suppliers, boot and foul weather gear merchants. The list of support businesses is long. One without the other means there is no industry. We must provide a platform for them to be included in our Fisherynation. They need our support as much as we need theirs. 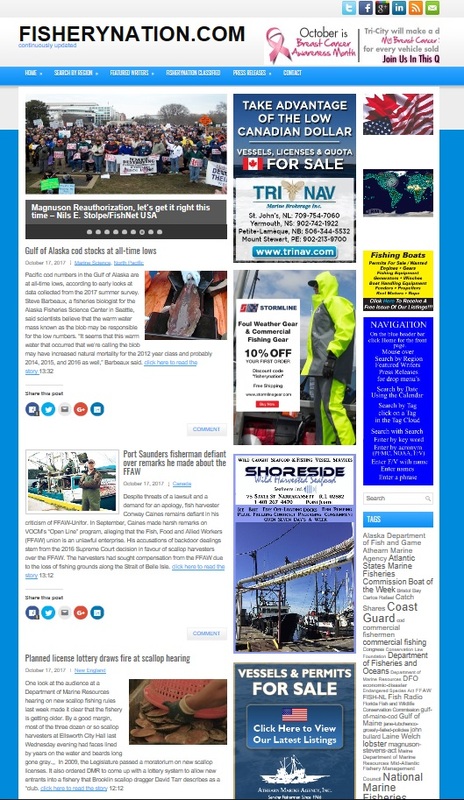 There must be more to Fisherynation than activism, and we will strive to make this place informative with featured articles on the front page, and a continuous stream of fresh news as we find it, located in the news/ blog section. Commenting on these articles will bring user’s together, and allow people to get to know one another, building friendships with many people from many places, and it will also give users a chance to learn about issues they are hearing about for the first time. It will give citizens a chance to learn. You can be an ambassador for your industry, doing damage control against misinformation many people unfamiliar with the industry have heard, caused by the relentless attacks by the organized ENGO’s. Some of the smartest, talented, and generous people I know are fishermen. I find myself amazed at how well written some are, and articles written by fishermen about a variety of subjects would be welcomed for our front page. Sea stories, engineer how to articles, favorite recipes from the cook, crew stories and picture essays would be interesting and appreciated, subject to review. Your support network of people that the important ones in life, family, are welcome to tell their sories, too! We are interested, and we care. We try to find news from various sources to provide as much current information to you as we can. We don’t find all of it, and if you see something that should appear at Fisherynation, use the contact form to let us know about it. We will get back to you, letting you know if we posted it or didn’t. This is a people industry, and we extend to you the place to post special events notices that are important to you. If you are from an organization that has a website, or a link to one and want it on our link page, send it. You can find the links page in the drop down menu under Featured. A lot of effort has gone into building this website, and it must be supported through some form of revenue generation, and selling ad space in various forms will be the way forward.